No Excursions in your cart. For those who seek a relaxing experience like fishing, the Aegean Sea is undoubtedly one of the most popular fishing destinations in Greece. Its crystal clear waters host numerous of different types of fish and sea creatures. Fishing in Santorini is a wonderful experience, especially when on one of the vessels of Santorini Yachting Club! Our captains have a thorough knowledge of the area and select the best spots for fishing, sailing across the coastline of southern Santorini. At the end of the trip, visitors will be able to get a taste of the local Mediterranean cuisine and prepare dishes with fish they caught themselves! Eating well is undoubtedly the key to good health and longevity. Enjoy a culinary selection of exclusive dishes, while on board one of our vessels. Tantalize your taste buds with traditional Mediterranean dishes, using the finest local ingredients. The ideal choice for travelers seeking relaxation during their vacation is a massage and wellness cruise with Santorini Yachting Club. During the cruise, a qualified Massage Therapist helps participants to de-stress and clear their mind. The yacht sails at a low pace on the Aegean Sea and under the sound of soft music, guests enjoy a carefree and rejuvenating experience, which has proven health benefits like improvement in blood circulation, greater flexibility and range of motion, and stress relief. By the time the tour ends at Ammoudi bay or Vlyhada port, it is guaranteed that a sense of well-being and peacefulness is achieved. Santorini Yachting Club innovates in order to enhance its guests’ experiences by offering wellness-related activities on board. We have designed cruises that combine yoga and navigation in the beautiful waters of the Aegean Sea, giving to travelers the opportunity to take part in a magnificent tour across Caldera and, at the same time, get in touch with their inner self. Yoga on board has even more extraordinary benefits both for the body and the mind, since cruising is by definition a relaxing and revitalizing experience. Having a yoga session during the cruise is quite different from having a traditional yoga session, since participants visit different locations of undeniable beauty and enjoy the peaceful coastal landscapes. Sessions are held both in the morning and in the afternoon, according to the visitors’ wishes. A Magical Subaquatic World. As mentioned in Ancient Greek texts, Atlantis was a very prosperous land in the Aegean Sea that had the mysterious misfortune to be sunk and lost in one day. Many scientists believe that Atlantis is Santorini itself. This is only one of the reasons that make scuba diving in Santorini so attractive: the idea that while diving in Santorini divers are exploring the ruins of this lost city of Ancient Greece is truly fascinating. On top of that, the seabed of the island is incredible, featuring transparent waters with great visibility, and many polymorphic underwater volcanic formations, including walls, cliffs, caves and riffs. So, while on holidays, visitors may admire these stunning formations that house various species of fish, colourful plants and sea creatures, composing a very impressive underwater scenery. This one-of-a-kind experience explains why divers travel from around the world in order to enjoy scuba diving in Santorini. 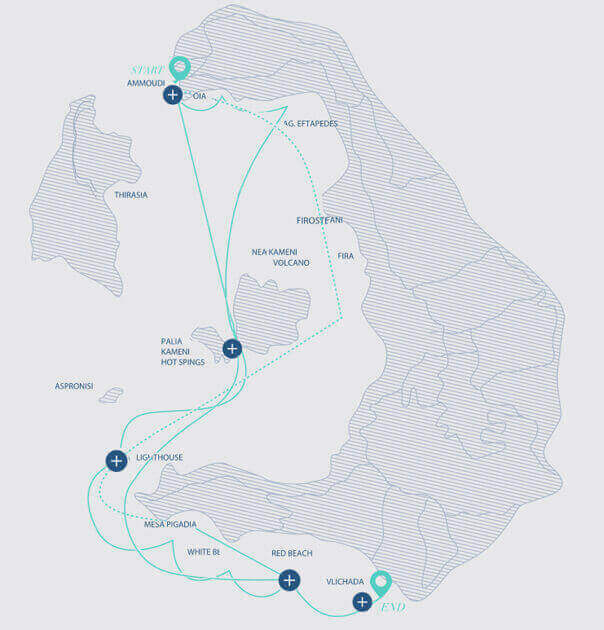 Visitors looking for a scuba diving centre will find not just one, but multiple, situated both in the western and the eastern part of the island. Embark on a nautical fairytale. Sailing at the mesmerizing sound of a harp, guarantees to travel your thoughts and senses to a different era. Being one of the oldest and most magical musical instruments, dating back to 3500 BC, the harp creates the most captivating melodies to accompany you while sailing towards the Santorini sunset or while popping the question on board. Having won numerous awards and accreditations, our harpist promises to elevate your sailing experience to a whole new level, adding a romantic touch to your excursion and making your dreams reality. Filming and Photography aboard. The sea has always been a source of inspiration for all aspects of art, including music, photography, painting, fashion and films. Specifically the Aegean Sea, with its stunning blue waters and its amazing sunlight, never ceases to inspire famous artists, designers and directors who devote entire collections, films or photography exhibitions to this blessed part of the Mediterranean. Santorini Yachting Club provides luxury yachts for professional purposes, including fashion services, professional filming and commercial photo shoots, giving the opportunity to capture the unique atmosphere of Santorini and the Aegean Sea in images that have the crystal clear blue water and the magnificent view of Caldera as a background.